How long do I have to file a Missouri personal injury claim after an accident in St. Charles? After you have been injured in an accident in St. Charles, or any event that was caused by the negligence of another person or party, you will have 5 years to file a Missouri personal injury claim to seek damages for the expenses, lost wages, and pain and suffering you endured as a result of the accident. The statute of limitations for wrongful death, on the other hand, is 3 years, and 2 years for medical malpractice. There is an exception to these parameters called the discovery rule. In the event that the injury or damage from the negligent act is not discovered at the time the act is committed, then the statute of limitations begins at the time that it was discovered. The discovery rule applies, for instance, in cases where the injury that caused a wrongful death might not have been readily apparent. In most cases, the statute of limitations begins to run once the injury occurs; however, if the injury is not discovered until a year after it happens, then the statutory period begins the day it is realized. If you or someone you love has been injured in a car accident in St. Charles, contact a St. Charles personal injury lawyer who can explain how the statute of limitations, the discovery rule, and other laws apply to the circumstances of your injury. You may only have a limited window of opportunity to begin the lengthy Missouri personal injury claim process, so don't let your accident injury claim wait. When an accident in St. Charles has a profound impact on your life, you may choose to seek compensation through a Missouri personal injury claim. With a lawyer on your side, you can feel confident knowing your case is in good hands, while you focus on your recovery and getting your life back on track. To get started with determining if you have a viable case, contact the Missouri personal injury team at Bollwerk & Tatlow, LLC - 314-315-8111. Will the vehicle that turned left always be found liable in a car accident in Missouri? In many instances, liability for a rear-end or left-turning car accident in Missouri is sometimes automatically determined, but not in all cases. Speak with a Kirkwood personal injury lawyer to discuss the specific circumstances of your case. The left-turning driver is typically found at fault because that driver is responsible for giving the right of way to oncoming traffic and to ensure there is enough space to make the full turn without interfering with the flow of traffic. There are a few exceptions to this general rule, and it should be remembered that they are rather difficult to prove. If the driver who was going straight through the intersection was speeding significantly, then he or she may be determined to be at fault for the accident. Similarly, if the driver who was going straight ran a red light or blew through a stop sign, then fault for the accident may be re-assessed on him or her. If the left-turning driver began to turn at the intersection when it was safe to do so but was unexpectedly forced to stop or slow down mid-turn, negligence may not be immediately assessed. This is difficult to prove because the burden of ensuring a safe left turn is on the left-turning driver. As in rear-end accident cases, the damage on the vehicles from the accident may provide more information or indication of fault. If you have been involved in a left turn car accident in Missouri, you may be in a position to require a Kirkwood personal injury lawyer to prove that you are not at fault. An attorney can answer your questions about the liability of your accident. When a car accident in Missouri has a profound impact on your life, you may choose to seek compensation through a Missouri personal injury claim. With a Kirkwood personal injury lawyer on your side, you can feel confident knowing your case is in good hands, while you focus on your recovery and getting your life back on track. To get started with determining if you have a viable case, contact the Missouri personal injury team at Bollwerk & Tatlow, LLC - 314-315-8111. Can I be found liable if my car is rear-ended in a St. Louis car crash? In most cases of a rear-end St. Louis car crash, the driver of the rear car is following too closely or driving too quickly to stop safely when the driver in front slows or stops. Even if a car in front stops quickly, the car behind should be at a reasonable distance so as to be able to stop without causing a collision. A Missouri personal injury lawyer can answer your questions about determining liability. The state of Missouri has adopted a "rear-end doctrine," which stipulates that the driver who rear-ends another car is automatically assumed liable for the accident and resultant damages, except in instances where evidence of negligence on the part of the front car driver exists, or when the front driver behaves in such a way that the driver in the rear cannot reasonably be expected to avoid a collision. There are also some other instances in which the driver of the car in the rear is not liable for the accident. In cases where a third vehicle forces the rear car into the front car, for instance, the third vehicle would be liable, not the rear car, who might have otherwise been driving safely and at a reasonable distance. This chain of events is a common cause of multiple-car accidents. If you have been rear-ended or have rear-ended another motor vehicle in a St. Louis car crash, speak with a Missouri personal injury lawyer about your options and how liability will be determined for your case. When a St. Louis car crash has a profound impact on your life, you may choose to seek compensation through a personal injury claim. With a Missouri personal injury lawyer on your side, you can feel confident knowing your case is in good hands, while you focus on your recovery and getting your life back on track. To get started with determining isf you have a viable case, contact the Missouri personal injury team at Bollwerk & Tatlow, LLC - 1-314-315-8111. When is it necessary to hire a Missouri personal injury attorney after a car accident in Kirkwood? If you've been in a car accident in Kirkwood, you're likely bombarded by a range of concerns and questions, and you're probably wondering if you should get a Missouri personal injury attorney involved. There are some instances in which you may not need the services of a Missouri personal injury attorney to address and settle your car accident claim, but it's advisable to consult with a lawyer about whether or not your particular case can be handled without one. the at-fault party has sufficient insurance coverage. On the other hand, if your claim for a car accident in Kirkwood involves serious injuries and hefty damages, contact a Missouri personal injury attorney for an evaluation of your case. Your Missouri personal injury attorney knows what the burden of proving fault is, which documents you'll need, how to negotiate with the insurance adjuster and what types of compensation you may be entitled to after your car accident in Kirkwood. Remember, even if you choose not to secure legal representation, you can always schedule a consultation with a Missouri personal injury attorney after the insurance company has offered you a settlement. If you're unsure about the amount offered, speak with a car accident lawyer who can advise you about the appropriateness of your settlement offer. When a car accident in Kirkwood has a profound impact on your life, you may choose to seek compensation through a Missouri personal injury claim. With a Missouri personal injury attorney on your side, you can feel confident knowing your case is in good hands, while you focus on your recovery and getting your life back on track. To get started with determining if you have a viable case, contact the Missouri personal injury attorney team at Bollwerk & Tatlow, LLC. - 314-315-8111. Should I contact my Missouri Workers' Compensation lawyer if the company doctor says I need surgery, but also wants me to get a second opinion? If your employer's doctor indicates that surgery is necessary but your employer says you must first get a second opinion, you should certainly relay this information to your Missouri Workers' Compensation lawyer. Your employer cannot demand that you get a second opinion before approving your surgery. This is sometimes the result of an attempt to have you eventually seen by a doctor who disagrees with the need for surgery. This would then eliminate your employer's responsibility to pay for it. Your Missouri Workers' Comp benefits are available to pay for any surgery or other treatment plan a doctor advises. Your lawyer can evaluate the facts of your case to determine if your rights to Missouri Workers' Comp benefits are being violated. If you have any other questions pertaining to your Missouri Workers' Comp benefits or if you need clarification on any aspect of your claim, you should speak with a lawyer. A Missouri Workers' Compensation lawyer will ensure your legal rights are protected and fight for you in the effort to secure your full compensation after a serious work injury. When a workplace accident in Missouri causes serious injury or death, Missouri Workers' Compensation is often the primary source of benefits to address the damages. 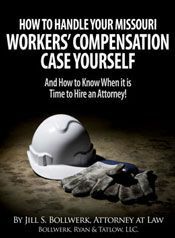 Order our FREE guide to Missouri Workers' Compensation for injured workers and learn more about this often complicated system. If you have questions about Missouri Workers' Compensation or your claim has been denied, delayed or unfairly reduced, contact the Missouri Workers' Compensation lawyer team at Bollwerk & Tatlow, LLC - 314-315-8111. Should I contact a Missouri Workers' Compensation attorney or be concerned about my Missouri Workers' Compensation claim if am sent back to work after a workplace accident and told it is "light duty"? If you are sent back to work after a Missouri workplace accident and told it is "light duty" you should know what your rights are. It will depend on a variety of factors. Since it can become complicated and you may be unsure of your rights, you may find it necessary to seek counsel from a Missouri Workers' Compensation attorney. Sometimes after an injury at work, you will be told you can return to work with certain restrictions on how much you can do. This is called "light duty" and will vary depending on the type of job you have and the tasks involved. If you are responsible for loading a truck and packages can weigh anywhere up to 50 pounds, your doctor may restrict you to no more than 20 pounds. While you might think this means you don't have to return work, your employer may have other work available for you, such as filing. If you are offered another type of work, you must accept it. If you do not, you jeopardize your right to benefits through your Missouri Workers' Compensation claim. There are times when it may become necessary to seek the help of a Missouri Workers' Compensation attorney. If you are released by a doctor to perform light duty work but your employer does not comply, you should speak with a Workers' Compensation attorney. Another time you may need a Workers' Compensation attorney is if your employer doesn't have light duty work available and won't pay you. To fully understand what your rights are as a worker when you have a Missouri Workers' Compensation claim, it is best to speak with an experienced Missouri Workers' Compensation attorney. When a workplace accident in Missouri causes serious injury or death, Missouri Workers' Compensation is often the primary source of benefits to address the damages. Order our FREE guide to Missouri Workers' Compensation for injured workers and learn more about this often complicated system. If you have questions about Missouri Workers' Compensation or your claim has been denied, delayed or unfairly reduced, contact the Missouri Workers' Compensation attorney team at Bollwerk & Tatlow, LLC - 314-315-8111. As one of many Missouri employees throughout the state, what is COBRA and why should it matter to me? The Consolidated Omnibus Budget Reconciliation Act (COBRA) is a federal program that helps Missouri employees and their families continue health benefits if there is a loss of coverage. COBRA insurance coverage may be the only option your family has to continue health coverage if there is an impact on the employment or life status of the person who carries the insurance in your household. Missouri employees and their families can benefit from this coverage by choosing to continue group health benefits for a limited time if the employer previously offered them. There are many things to consider when choosing to accept COBRA insurance coverage. You may have to pay the entire premium yourself for coverage up to 102% of the cost to the plan. There are also restrictions on how long the COBRA insurance coverage will last and not all Missouri employees will be eligible. This means you and your employer will need to communicate when you're applying for COBRA. For questions regarding COBRA insurance coverage or if you are having difficulty obtaining or handling your health care benefits through COBRA, you should consult with a St. Louis insurance attorney. Your attorney can explain your coverage options when job loss, benefit cuts, death or divorce impact your health insurance status. Missouri employees are eligible for the same federal benefits and insurance protections as any other U.S. citizens. If you are having difficulty obtaining coverage or collecting benefits under the federal COBRA system, contact a St. Louis insurance attorney at Bollwerk & Tatlow, LLC for help with challenges in your COBRA insurance coverage. Call today to schedule a free consultation - 314-315-8111.